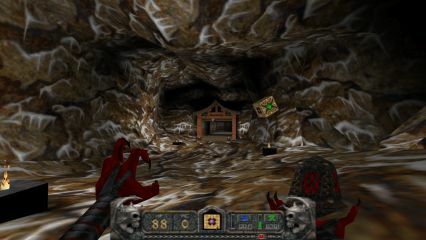 Having gotten lost and bored in the very first level of Heretic's shareware episode a long time ago, I never bothered with the Heretic and Hexen games. Still, some screenshots of Hexen 2 published alongside a review of the game in a local gaming magazine back in 1997 caught my attention; this was just when GPUs were becoming commonplace, so all those smooth, filtered graphics looked very appealing. But it took 20 more years for me to actually pick up the game. So here we are. Note: The game was purchased on Steam, but I ran it using the Hammer of Thyrion port. 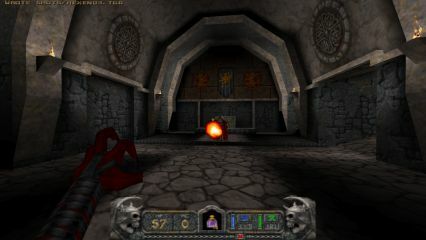 The Portal of Praevus mission pack is not included in the Steam version; there are no legal ways to obtain it aside from the second-hand market. 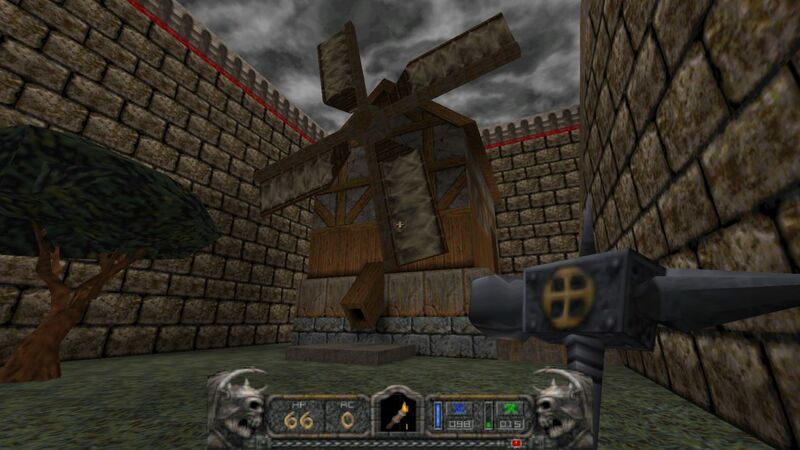 The thing about Hexen 2 is that it easily could have passed for a Quake Total Conversion (which it of course is). 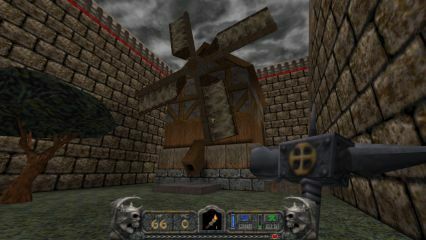 Compared to Quake, the castles of Hexen 2 have more furniture in them and the environments are in general less static (i.e., there's more breakable stuff and stuff that moves). The scale doesn't feel much different from Quake though; the engine was a resource-hog when it was released, which is why Quake's maps were so claustrophobic compared to the wide open spaces of Duke3D. (This was at a time when you could expect 30 or so frames per second even with a good GPU.) 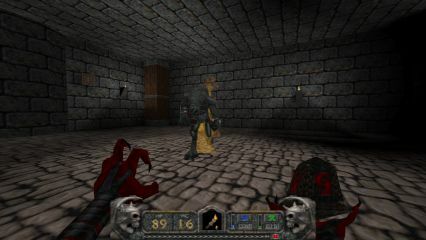 The game also has some RPG elements, but these are quite superficial; there aren't really any optional areas as such, so your character's growth path will always be more or less the same. You can carry a bunch of stuff in your inventory and use them (some of which make more sense in multiplayer) when you want. Sound effects are punchy (another thing inherited from Quake), but I had to turn off the midi soundtrack; I probably would have had a higher tolerance for it if I had played the game as a kid. The game is divided into four different time periods with each having its own hub. A hub can lead to several different maps, all of which have many obstacles that require you to pick up some exotic item or perform some obscure operation. There are some hints as to what you need to do to get where you're going, but these hints tend to be rather cryptic. Moreover, many essential items, buttons and routes are hidden behind secrets, which wasn't a "thing" in terms of acceptableness in the '90s any more than it is today (the hidden passageway behind the babe poster in E1L3 stands out precisely because it was an exception). 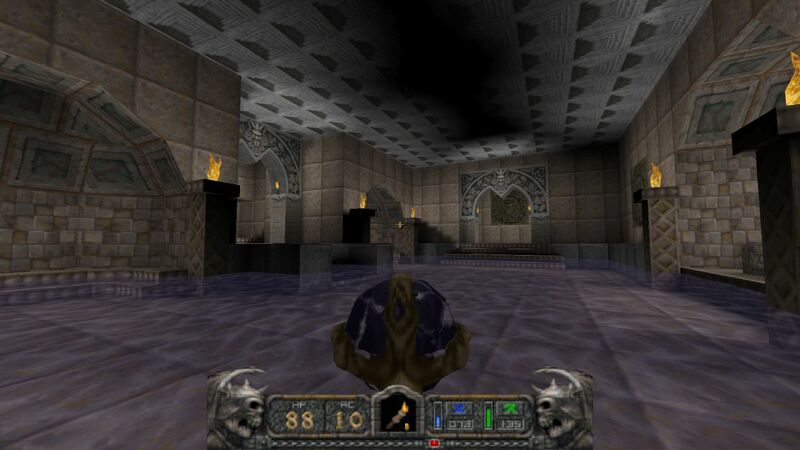 Add to this confusing layouts (the non-hub maps tend to be generic dungeons without a recognizable "center") and you're in for a lot of tedius backtracking (without which you could probably cut two hours off the game's six-hour length). Quake 2, released a few months later, had the hub-mission system figured out a lot better. 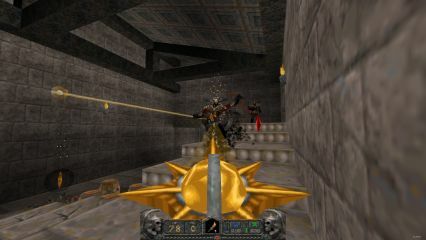 Combat is pretty tough and you have make good use of your inventory to stay on top; even the melee weapon has to be relied on from time to time because of how fast mana (used by the other weapons) can deplete. Add to this a good selection of well-animated monsters and punchy sound effects and you're left with a combat system that's pretty satisfying. However, too many enemies are annoying critters and bugs, each playable character gets only three unique weapons (one that uses blue mana, one that uses green mana and one that uses both) in addition to their melee weapons, and the bosses are very unimaginative, involving little besides strafing and shooting. Moreover, I found the game's controls noticeably slippery. 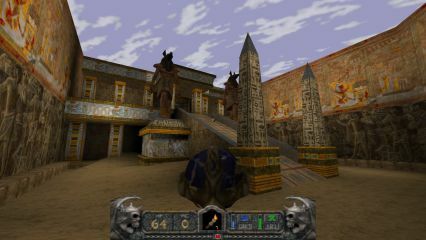 Portal of Praevus is a typical '90s "mission pack" with two hours' worth of extra content along the lines of the base game. There are two marked improvements: First, the mission pack is more linear than the base game and uses short cutscenes to guide you in the right direction whenever you operate a switch, which lessens (but doesn't completely eliminate) the amount of mindless wandering. 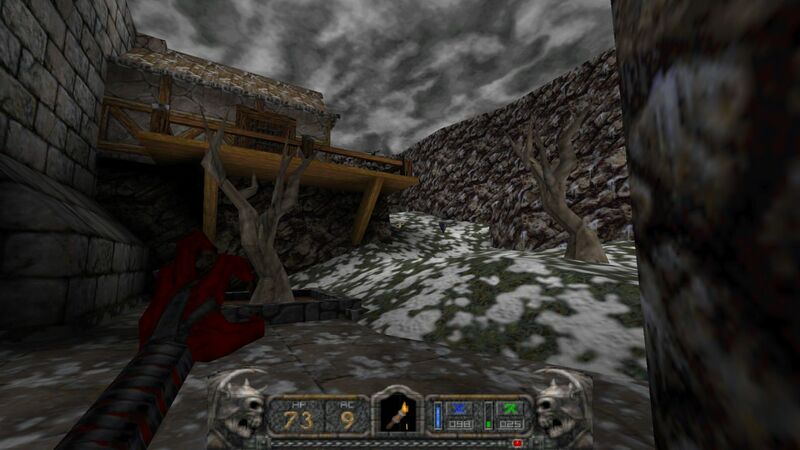 Second, the maps are more detailed with some nice looking outdoor areas, probably a result of the quick switch to GPUs between the release of Hexen 2 and the mission pack. You also get to play as the Demoness, a new character who's got a projectile-based first weapon.